The Medieval Times encompass one of the most exciting periods in the History of England and Europe. The names of many famous Medieval women scatter the Medieval History books and other historical documents - they were mostly queens and princesses. But what about the women who were not of noble birth? Who were these Medieval women who became famous despite the dominance of men during this era? The following biography, short history and interesting facts provide helpful information for history courses and history coursework about the key dates and events in the life of Anna Comnena who was famous as the worlds first female historian. Occupation and Career: Byzantian Princess who retired to a convent following the death of her husband. During this time she wrote a book about her life. A Medieval writer and historian. 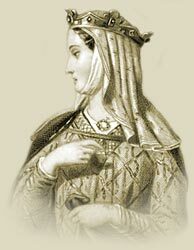 Accomplishments and Achievements or why Anna Comnena was famous: Anna Comnena is considered the world's first female historian. She wrote a book, in 15 volumes dedicated to the biography of her father called the Alexiad. The story and biography of Anna Comnena which contains interesting information, facts & the history about the life of this Medieval woman of historical importance. The Alexiad contained historical information about the life and times of the early Middle Ages. Emperor Alexius Comnenus lived from 1048 to 1118. He was emperor of the Eastern Roman Empire at the time of the First Crusade. The Byzantium empire was the Greek-speaking Roman Empire during the Medieval times of the Middle Ages which was centered at its capital in Constantinople. The Byzantine Empire stretched from Azerbaijan and Armenia in the east, to Calabria in Southern Italy to the west. The Byzantines saw themselves as the ancestors of the Ancient Greeks. Alexius appealed to Pope Urban II for help in driving the Turks from Byzantine territory in 1095. This resulted in the influx of thousands of Crusaders on his territory - he had only wanted help from a small number of mercenaries. The Alexiad written by Anna Comnena in honour of her father, describes the events of this era providing invaluable material about the first crusade and the crusaders who fought in the battles. The Alexiad describes details about the daily life at the Byzantium court. The life and history of her family, And the exchanges between the Byzantine people and crusaders who travelled through her fathers lands during the first crusades. Anna Comnena despised Latin and all of her work in the Alexiad was written in Greek. In 1054, relations between the Greek-speaking Eastern and Latin-speaking Western traditions within the Christian Church reached a terminal crisis. This led to the separation between the Eastern and Western churches and referred to as the Great Schism. The Christian Church split along doctrinal, theological, linguistic, political, and geographic lines. The split, the Great Schism, led to the development of the modern (Roman) Catholic and Eastern Orthodox churches arose. Interesting facts and information with a short biography about the Medieval Life, Times and history of Anna Comnena. Additional useful details, facts, history, biography, timeline and information about the lives of other famous people of the Dark Ages and Middle Ages, and the important events which occurred during their times, can be accessed via the Medieval Life and Times Sitemap. The content of this article on Medieval life and times provides free educational details, facts and information for reference and research for schools, colleges and homework for history courses and history coursework.